Plans to build 10 wind farms off the coast of Scotland moved a step forward after the Crown Estate gave companies the green light to explore the sites. Scottish Power and E.ON are among the nine firms to be awarded "exclusivity agreements" for locations which include the Solway Firth and Wigtown Bay. This will allow developers to begin surveying the sites while a government environmental assessment is conducted. The wind farms have the potential to generate 6GW of power if approved. Rob Hastings, director of the Marine Estate at the Crown Estate, said the deals were good news for Scotland. He said: "We very much look forward to working with the companies on the development of these sites and the realisation of the enormous potential that these sites have to offer." Jason Ormiston, chief executive of Scottish Renewables, said it was a landmark move. He said: "Today heralds an exciting phase in the progress of the renewable energy industry in Scotland. The combined capacity of these projects will make a massive contribution to Scotland's efforts in tacking climate change, helping to deliver reliable and affordable supplies of electricity to consumers and, very importantly, the Scottish economy." The agreements are designed to allow companies to begin surveying the sites while the Scottish Government carries out its Strategic Environmental Assessment (SEA) for offshore wind within Scottish territorial waters, which is due to be completed early next year. The Crown Estate can only award lease agreements to firms if the government approves the sites. RSPB Scotland said it supported the Crown Estate's move towards renewable energy but was concerned about the impact on Scotland's marine environment. Aedan Smith, head of planning with RSPB Scotland, said: "Poorly sited developments could harm seabird populations through collision or disturbance, but we're confident that Scotland can meet its renewable energy targets several times over without putting wildlife at risk. "Good quality survey work will need to be carried out to assess sites prior to development and we will scrutinise each site in detail before deciding our position." Keith Anderson, director of ScottishPower Renewables, welcomed the "exclusivity agreement" awarded to the company for the Argyll Array site. He said: "Today's announcement is the first step on a long but important journey, and over the next 12 months we will carry out detailed studies of the site and will consult widely with stakeholders to help shape any future scheme." 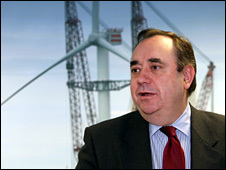 First Minister Alex Salmond said the windfarms would boost the government's green energy ambitions. Speaking as he officially opened the offices of SeaEnergy in Aberdeen, he said: "Scotland has a fantastic competitive advantage in developing offshore renewables - with up to 25% of Europe's offshore wind, wave and tidal energy potential, and a world-class scientific capacity and skills base. "The current financial downturn illustrates the importance of capitalising on our unique assets." The Scottish Government has set targets to meet 50% of electricity demand from renewables by 2020.